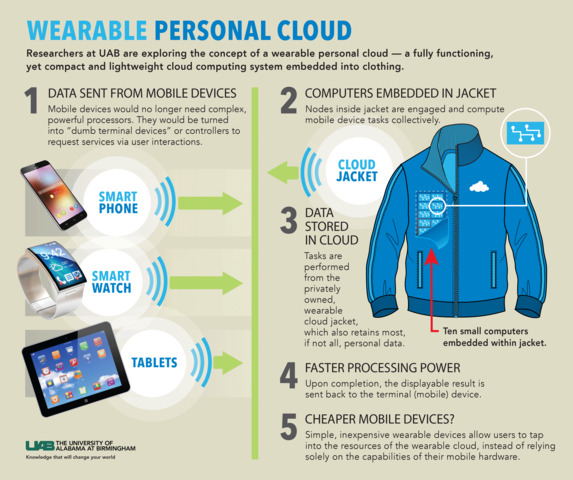 Researchers at the University of Alabama at Birmingham are exploring the concept of a wearable personal cloud — a fully functioning, yet compact and lightweight cloud computing system embedded into clothing. Ragib Hasan, Ph.D., assistant professor of computer and information sciences in the UAB College of Arts and Sciences, and Rasib Khan, Ph.D., a recent postdoctoral graduate student, presented the concept and prototype of a wearable cloud jacket at the 40th Institute of Electrical and Electronics Engineers Computer Society International Conference on Computers, Software & Applications (IEEE COMPSAC) in June. Using 10 low-cost, credit-card-sized computers called Raspberry Pi’s, an old winter jacket, three power banks and a small remote touch screen display, Hasan and Khan developed a wearable system that brings all mobile computing solutions together, creating the ultimate smart device. The cloud jacket could make the design of mobile and wearable devices simple, inexpensive and lightweight by allowing users to tap into the resources of the wearable cloud, instead of relying solely on the capabilities of their mobile hardware. The need for more powerful processors and consumer expectations for high-performance applications have caused the design of wearable and mobile devices to be complex and expensive. Someone who wishes to own a smart watch, smart glasses, a smartphone and a wearable health device would have to spend between $2,000 and $3,000 to purchase such devices. The cloud jacket prototype has roughly 10 gigabytes of RAM, while the average smartphone has only one to three gigabytes. In regard to storage, each Raspberry Pi within the jacket has 32 gigabytes of memory available. Most wearable and mobile devices are made with processors that are nearly 10 times slower than desktop or laptop processors, limiting the types of applications that can be run on them. With mobile apps’ becoming more complex, newer, more powerful versions of mobile and wearable devices are continuously released in order to keep up with changes in technology, resulting in increased prices. To make up for resource limitations, many mobile applications are also powered by cloud servers, which require constant communication over the internet. Mobile and wearable device users are required to upload all personal data to remote public clouds or local cloud data centers, without the knowledge of where their personal data is actually being stored. With a wearable cloud, mobile and wearable devices would no longer need complex, powerful processors. By turning them into “dumb terminal devices” or controllers, the wearable cloud would provide the experience of a smart device. By connecting the terminal devices via Bluetooth or Wi-Fi, a user utilizes the devices to request services via a user intuitive display and interactions. The computational task is sent to the wearable private cloud. Nodes inside the jacket are engaged and compute the task collectively. Upon completion, the displayable result is sent back to the terminal device. The tasks are performed from the privately owned wearable cloud jacket, which also retains most, if not all, personal data. Hasan and Khan’s wearable cloud concept differs from existing “smart clothing” solutions in that they only act as input devices. Current products such as the Levi’s “Smart Jacket” allow a user to make hand gestures on the jacket to answer a phone call or shuffle through a playlist. The wearable personal cloud concept is not limited to clothing. The system model allows the personal cloud to extend to any item carried on a daily basis, from a jacket to a briefcase, purse or backpack. Hasan and Khan believe this type of technology solution could aid in a variety of ways, from the way first responders communicate and share information during disasters to the way soldiers communicate on the battlefield. Suppose a disaster occurs and first responders are entering a damaged building. They may have blueprints of what the building looked like prior to the incident, but only those inside know what areas are now damaged or where an injured person is located. By pairing the wearable cloud with a device like Google Glass or night vision goggles, anyone with access to the cloud can see whatever the person wearing the cloud is seeing in real time, without the need for platform- or device-specific hardware and software. Hasan and Khan call this a delegated experience. Their paper, "A Cloud You can Wear: Toward a Mobile and Wearable Personal Cloud" can be found here. Hasan is the director of the UAB SECure and Trustworthy Computing Lab and 2014 recipient of the National Science Foundation’s CAREER Award for his research on trustworthy cloud computing. He is also the founder of Shikkhok.com, an award-winning free education platform in the Bengali language, and the coordinator of the BanglaBraille project, aimed at creating educational material for visually impaired children in South Asia. 0 Response to "Wearable cloud could be less expensive, more powerful form of mobile computing"